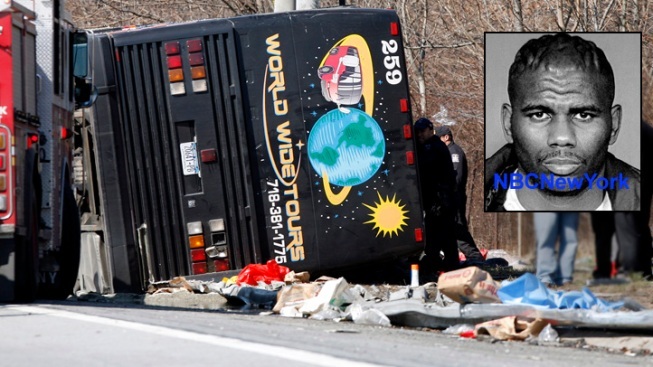 The driver of the bus that crashed on I-95, killing 15 people on its way from a Connecticut casino back to Manhattan, has a criminal record that includes an arrest for driving with a suspended license and possession of three police radio scanners. NBC New York obtained a photo of the driver, Ophadell Williams, along with detailed information about his criminal past. The photo was confirmed by law enforcement officials and neighbors along his block in Bushwick. Williams has not been charged with any crime related to the crash and officials stress the investigation is still in its early stages. Williams blew a .00 in a blood-alcohol test at the scene and voluntarily offered blood for a more precise blood alcohol test, officials said. Authorities have said they are examining what Williams did in the 72 hours prior to the early morning crash, and have indicated the investigation could turn into a criminal matter. The New York State Inspector General will look into how Williams was able to obtain and retain a commercial driver's license, given his criminal and driving history, Governor Cuomo said. The tour bus company, World Wide Tours, has declined repeated requests to comment on the driver's history and its hiring procedures. Williams told police that he took a nap on the bus in a casino parking lot in the hours before picking up passengers for the trip back to Chinatown, investigators said. It also appears that Williams did not keep his driver's log up to date as he was required, officials briefed on the case said. Police wanted to check that log to see how much time he was spending on the road and what kind of breaks he was receiving between trips. Williams arrived at the Mohegan Sun Casino around 11 p.m. to drop off passengers, said sources who are working to piece together a timeline of the horrific crash. According to those sources who recounted the driver's story, Williams then drove to another lot and took a nap until he was called back to pick up the group for a trip to New York at 3 a.m. The bus crashed in the Bronx, skidding into a highway sign post, which entered through the front window and sliced the bus from front to back along the window line. One official familiar with the case said investigators are looking into whether the driver fell asleep behind the wheel of the bus -- or was somehow not paying attention just before the 5:30 a.m. crash. Wiliams' criminal record includes the June 2003 arrest for driving with a suspended license. He was also charged with aggravated unlicensed operation of a vehicle and possession of the police scanners. Police records show Williams was also charged with three felonies and two misdemeanors as an adult, including pleading guilty to one charge of manslaughter. Documents show Williams served prison time from 1992 through the time he was paroled in 1994 on the manslaughter charge. He also had past arrests for grand larceny and criminal possession of stolen property in 1998 and went back to prison, documents show. He was released from parole in 2004. Another past arrest was for "intent to obtain transportation without paying" -- which records show he pleaded guilty to a violation back in 1987. As NBC New York first reported, some passengers said the bus seemed to be drifting in and out of lanes hitting rumble strips on the side of the highway. Some told police they feared the driver was tired or distracted. State police said the bus may have been speeding faster than the 55 mph limit. The driver's wife, Holly, told the Daily News that Williams "feels like he's at fault." He has not responded to NBC New York's repeated requests for comment. The National Transportation Safety Board said at a briefing Sunday that the bus, which was carrying 31 passengers from the casino to Manhattan's Chinatown, slid for 480 feet before it came to a stop. In addition to the fatalities, seven other passengers were critically hurt. Ten out of the 19 injured have been treated and released. St. Barnabas Hospital said it had discharged Williams Sunday night. Doctors at Jacobi Medical Center remain optimistic about its six remaining patients. "These people are very, very badly injured. Many of them are still on respirators... but we have an expectation that they should survive," said Dr. Sheldon Teperman, Chief of Jacobi's Trauma Service. Two victims remain unidentified at this time.